Frank was an awkward child growing up. He struggled with low self-esteem, poor social skills, and bad cases of body odor. He was alienated and picked on, which made him grow bitter and angry, and as he matured, he vowed he’d get even with everyone one day. Currently, Frank is an awkward adult struggling with low self-esteem, poor social skills, and bad cases of body odor. He is alienated and picked upon by society and was denied job after job due to his prominent character flaws. These sort of embittered souls are ripe picking for Max Indeks, who offered the despondent Frank a job and chance to even the score with the many people who belittled him. Frank quickly accepted and became one of the many thugs under Max’s employ in the League of Villains. Frank specializes in using the sleeping gas miasma to get the job done, putting his enemies to sleep before robbing banks, businesses, and houses. He’s still fairly inexperienced as a supervillain and not too many heroes take him seriously. Even fellow villains are less than willing to team up with the odorous villain if they can avoid it. His trademark gas is easily detectable by its strong scent and bright green color, and its lingering smell is often enough evidence to let authorities know each and every place he’s been too, building up a strong case against him. So far, the self-created Miasma Man has escaped authorities, more due to strong criminal connections than individual skill. He most recently had a run-in with Gem Angels Jade Lightning and Crystal Cycloneduring while out with Syman Sayz. The two were caught enjoying the services of a body-swapped Valor Girl, but their fiendish pleasure pursuits were put to an end. Following this, Miasma Man was confronted by heroines Nightengale and Pink Pussycat, who had tracked him down to his lair in the sewers of Metrobay. The confrontation did not go well for Franklin. A gas leak and a spark later and he was caught in the midst of a terrible explosion and presumed dead. Unbeknown to the heroines, he survived, his body bonded with the chemicals of his lair, turning him into an entity of pure, intangible gas. 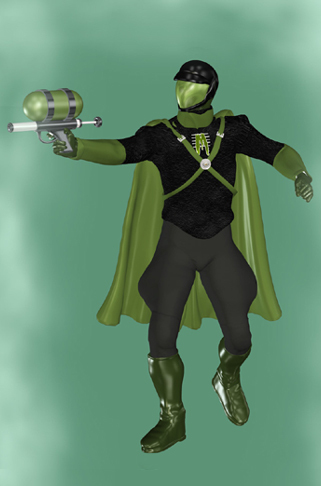 Containing himself in a special suit and building a small army in the shadows, Miasma Man waited and plotted his revenge against the heroines. 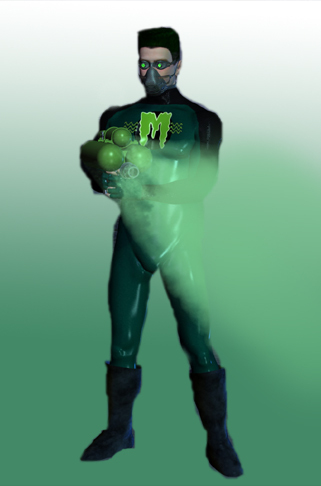 After his accident, Miasma Man made several attempts to find a cure for his condition. He found sympathy in the arms of the demented Doctor Tinker, who promised to help him, and the two became partners and also lovers, eager to make the Superheroine Squad pay for their actions. Together, they captured several heroines and began the process of curing him, but the resulting experiment proved flawed and Miasma Man’s flesh instead appeared plastic and inhuman. 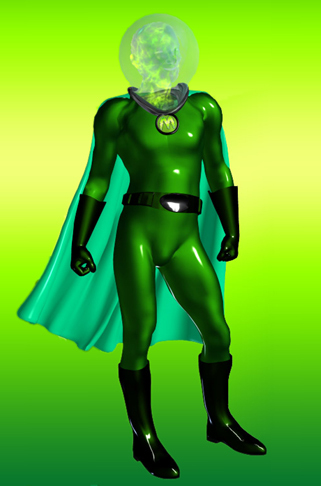 Originally a normal human being, after his accident in the sewers, Franklin become superhuman. With a body consisting of pure gas, he must reside inside an artificial suit to interact with the rest of the world. While this has its disadvantages, such as him having to rely on his suit for physical contact and intimacy, his vaporous form prevents him from being trapped or caught, making him a wily foe to face. His natural gas form, also, is capable of emitting miasma gas capable of rendering even the strongest heroine unconscious in only a few whiffs.